Mussels may look a little intimidating, but they are actually one of the easiest seafood choices to prepare. Though it's a simple dish, steamed mussels with garlic and white wine is regarded as one of the most elegant classics in the culinary arts. Serve them in a big bowl with hunks of crusty bread for soaking up the cooking liquid for a traditional presentation. Or try them with pasta or over rice. A type of bivalve mollusk, mussels are similar to clams and oysters. They grow in saltwater habitats up and down the Atlantic coast from the Arctic to Virginia. The PEI mussels frequently found in grocery stores and served at restaurants in the United States come from Prince Edward Island, Canada's largest producer of Mytilus edulis, a species commonly known as the blue mussel for its shell color. The meat may be cream-colored or pinkish, depending on the gender. Most of the mussels you're likely to see at the seafood counter have dark blue, black, or sometimes green shells. They may also have stringy little "beards" sticking out of their shells, which you should pull off or trim with kitchen shears. In the old days, you had to flush sand out of fresh mussels. The process involved soaking them in water with a bit of cornmeal, and it was a bit of a hassle. Now commercial mussels are either farmed or they've already been flushed, so you generally don't need to worry about grittiness anymore. Get rid of any mussels with wide-open, cracked or discolored shells. 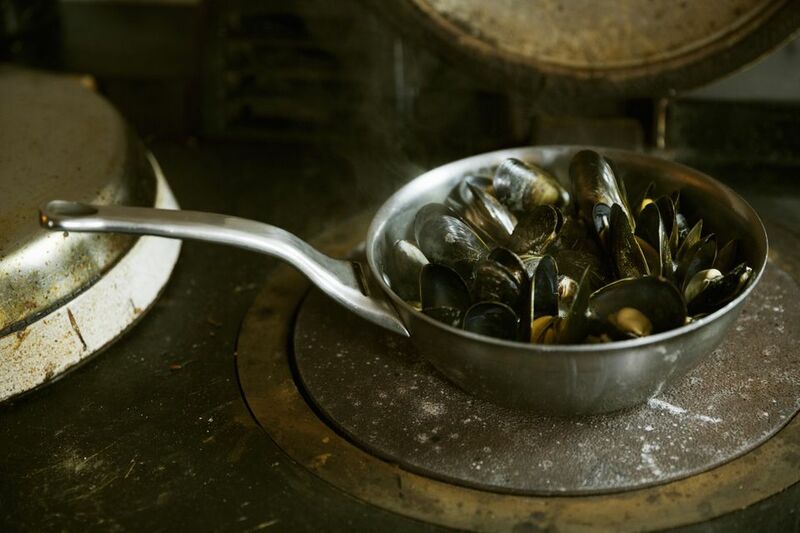 A fresh mussel should smell like the sea—salty and a little sweet—so toss out any that don't smell good. If you find one with a slightly open shell, tap it gently with your finger; if it doesn't immediately close, put it in the discard pile. Mussels are so easy to prepare, you could dump them in a dry pan and cook them over medium-high heat, covered, until their shells open and they release their fragrant liquor. Then you can stir in some butter and black pepper and serve them with crusty bread for dunking in the gorgeous liquid. But while you can cook them in a dry pan, it's nice to add a little white wine to help with steaming and to add flavor to the liquid. However, note that you're not simmering them; you're steaming them. You want just a little bit of liquid at the bottom of the pan. Fresh mussels simply prepared taste faintly of the sea, with a sweet brininess and a texture almost like a mushroom—firm yet still almost delicate. They should not taste fishy or overly salty. Overcooked mussels turn rubbery, making them hard to chew and swallow. The light flavor of fresh mussels makes them quite adaptable to whatever preparation you choose, from unadorned mussels straight off the grill to the classic steamed mussels in a luxurious white-wine and garlic-butter sauce or a spicy Spanish take with tomatoes. You can purchase fresh mussels at the seafood counter of well-stocked grocery stores or from specialty seafood markets. Look for farm-raised mussels, which provide the most reliable product without the grit often found in wild ones. Portion size is around 3/4 to 1 pound per person, depending on whether you're serving them as an appetizer or a main course. When shopping, it's a good idea to purchase extra since you may find a few dead ones or cracked ones that you'll have to discard, and then after cooking you'll invariably find a few that didn't open and cannot be served. Fresh mussels are alive, and you want to keep them that way. Dead ones aren't edible and can make you sick. The best way to store mussels is in the refrigerator, in the original mesh or net bag they came in, wrapped in a wet paper towel or even wet newspaper. The key is to keep them cold and wet. However, don't store them in water and don't seal them up in a container or a plastic bag—they need to breathe. Your fishmonger might wrap your mussels up in the paper for you to take home, in which case, you can store them on a tray with a wet paper towel around them. You can store mussels on ice (but only in the fridge, not the freezer) as long as the melted ice can drain away so that the mussels don't end up submerged. To do this, you can put them in a metal colander inside a bowl. Using the methods described above, you can store mussels for 24 hours without a problem. But in general, it's best to purchase fresh mussels the day you plan to eat them. Low in fat, high in protein, and a surprisingly good source of vitamin C, cultured mussels are a comparatively inexpensive, readily available, and sustainable shellfish. They also contain high levels of vital nutrients such as iron, manganese, selenium, and vitamin B-12.